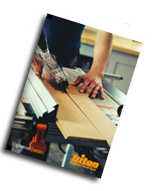 For over 43 years, Triton tools have been created by woodworkers, for woodworkers. We know that the greatness of every project - joinery, carpentry, craft or sculpture – lies in the details; that’s why every Triton product contains hand-picked innovations to improve accuracy, finish and ease of use. Based in the UK, Triton is renowned for intelligent design that provides superior safety and control. With our award-winning power tools, hand tools, work systems and accessories, you can rely on Triton every time. Welcome to the home of woodworking.